Thornton, K. (2015). Supporting student staff through effective training. Studies in Self-Access Learning Journal, 6(4), 431-432. Gone are the days when a self-access centre consisted of bookshelves and a cabinet of VHS tapes that students checked out from a manager or administrator. Language Learning Spaces in the twenty-first century are social learning spaces, where people learn with and from others as much as, if not more than, from physical or Internet-based resources. As was highlighted in the previous instalment of this collection, successful learning spaces create a sense of community among users, and student staff are often key members of these communities. Training these students so that they have the appropriate mindset and skills to maximize users’ learning potential is by no means an easy matter. High turnover of staff and limited time to be devoted to training by managers and academic directors can all hinder the process of developing staff members’ skills. While one of the aims of employing student staff is to facilitate the creation of a learning community, the staff themselves often work in isolated shifts and may not know one another well. As educational institutions, universities have a duty of care to their student workers, and providing appropriate training is an important part of helping students reach their potential and preparing them for the world beyond university. The reflective accounts featured in this issue highlight different models of staff training and the affordances they may offer for managers looking to improve the skills of their student staff. In the first paper, Catherine Jeanneau and Stéphanie O’Riordan describe an award-winning programme at the University of Limerick, Ireland, which trains international students to run peer-conversation sessions in the Language Learning Hub. Through a combination of lectures, session observations and reflection, overseas students studying in Limerick get the chance to earn credit and learn the skills necessary to successfully facilitate target language practice over the course of a semester. This programme offers an alternative model for centres who may be unwilling or unable to employ paid student staff. Finally, Naomi Fujishima from Okayama University, Japan, uses training session observations and interviews with student workers in the social learning space to investigate how both home and international students are trained to perform a variety of roles in the centre, from receptionist to language lesson teacher. She highlights the challenges in making sure students are equipped with the skills necessary to help themselves and other users negotiate the dynamic interactions of a social learning space where the emphasis is on students learning from each other. The next instalment in the Language Learning Spaces series will examine several different programmes which aim to foster learner autonomy among facility users. Katherine Thornton has an MA in TESOL from the University of Leeds and is the founder and Program Director of English Café at Otemon, a self-access centre at Otemon Gakuin University, Osaka, Japan, where she works as a learning advisor. Prior to her current position, she worked as a learning advisor at Kanda University of International Studies, Chiba, Japan. 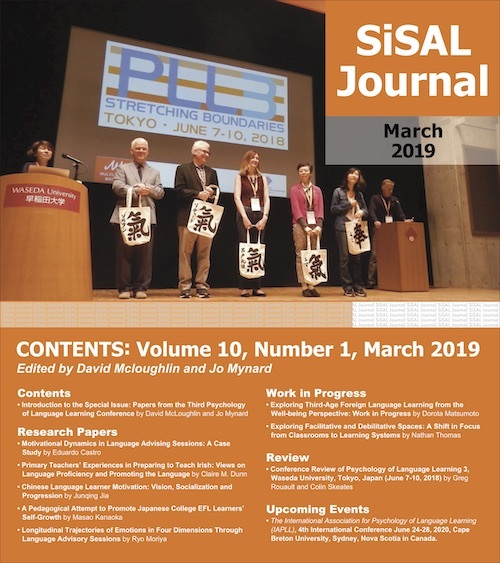 She is president of the Japan Association of Self-Access Learning (JASAL), and a regular column editor of Studies in Self-Access Learning (SiSAL) Journal. Her research interests include self-access centre management, advising for language learning, and self-directed learning.